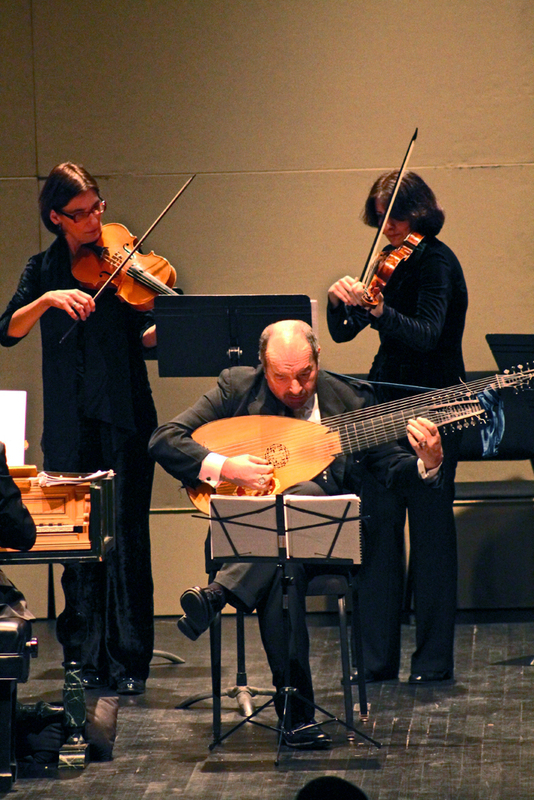 The Venice Baroque Orchestra brought a taste of the great baroque composer Vivaldi to University of California, Santa Barbara’s Campbell Hall on Thursday, Feb. 6, for Arts & Lectures’ winter 2014 Classical Music Series. The concert combined the feeling of attending a formal event with an accessible experience for a wide array of people, including students, professors, and even children. Venice Baroque Orchestra is an internationally known orchestra founded in 1997 by Andrea Marcon. Marcon, a scholar of Baroque music and a harpsichord player, has received many awards for his work, including the Vivaldi Award of the Cini Foundation. He is a professor of music at the Schola Cantorum Basiliensis in Switzerland. The Venice Baroque Orchestra has performed throughout the world and has been praised widely for its performances in North America, Europe, South America, Japan, and Korea. The orchestra is currently in California, and has performed in Los Angeles, Santa Barbara, Berkeley, Arcata, and Rohnert Park. The orchestra played seven pieces, five of which were composed by Vivaldi and one by Italian Baroque composer Veracini. Francesco Geminiani, another Italian composer from the same time period, composed the final piece. The concert was everything one would expect of a baroque concert—pleasant and impressive, but somewhat repetitive in its consistency to people with untrained ears. But even for those unfamiliar with classical music, the music was resonate and moving. The polished ensemble included a variety of musicians, from a harpsichord player, violinists, and a bassoonist, to even an incredibly talented recorder player. The highlight of the concert came after intermission, when Anna Fusek exited the stage with her violin and came back with a recorder. Born in Prague in 1981, Fusek studied philosophy and musicology at the Humboldt University Berlin, earning her master’s degree in 2005. In addition to playing violin and reorder, she has acted in Francesco Cavalli’s Baroque opera, “La Calisto,” based on the seduction of a Greek mythological nymph. At Campbell Hall, she showcased her talents as a violinist and recorder player. Though the recorder has certainly earned a reputation in elementary, perhaps as the instrument fourth graders use to learn how to read music, Fusek offered uninformed members of the audience a chance to experience the versatility and beauty of the recorder. Her performance was remarkable not only because of the rare chance to see a recorder in action in an orchestra, but also because of her musicianship. The recorder sounded nothing like what most people are familiar with. The flawless high-pitched tone Fusek was able to achieve resembled something closer to a piccolo than a recorder. Overall, the concert was an excellent way for UCSB students, professors, and other members of the community to experience post-Renaissance music. Even for those unfamiliar with Vivaldi and classical music in general, the Venice Baroque Orchestra offered an interesting taste of classical Italian music.